Tommy Smith hammered in a late winner to give Ipswich Town victory over promotion rivals Watford. 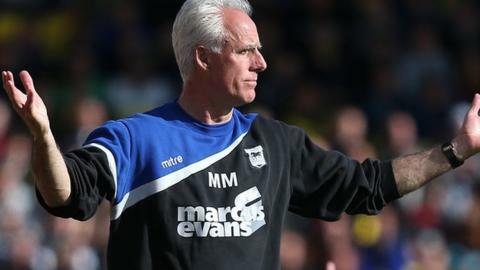 The defender finished a goalmouth scramble in the 83rd minute to lift Mick McCarthy's side to fourth. In the first half home keeper Bartosz Bialkowski made a point-blank save from Gianni Munari before Heurelho Gomes tipped over Daryl Murphy's superb flicked effort at the other end. Watford's Fernando Forestieri shot over from six yards before Smith won it. It could prove an important win for Town who, like Watford, find themselves in the thick of a congested promotion race in the Championship, where the top six are separated by just four points. They controlled the majority of the possession against the Hornets, who had suffered a surprise 2-1 defeat at Birmingham City in midweek, but could have been behind early on when Forestieri slipped in Munari, only for the Italian to shoot at the legs of Bialkowski. For all their ownership of the ball, Town could only register Murphy's first-time flicked volley as a clear first-half chance, but Gomes denied the Irishman a 10th goal in his last 12 games. Had Forestieri slotted in Matej Vydra's wicked cross in the final 25 minutes, Slavisa Jokanovic might have been celebrating his third win as Watford boss, however he now has two defeats on his record, both of which have come in the last five days. Instead, his counterpart McCarthy was able to celebrate a third consecutive win when Kevin Bru's shot from the edge of the area rattled around the six-yard box and New Zealand international Smith had the wherewithal to flash in a shot that Gomes got a hand to but failed to keep out. "I've not looked at the league. I'm not interested. I'm just really pleased with the performance and the victory. "I think Watford are a very good team. I think we've had to play exceptionally well and defend really well. "Both goalies and defences played well and at half-time I said that was a really good Championship game. It was about whoever blinked first and they did." "I can be happy with some parts of the game. My team had chances, particularly in the first half. "But my team played many minutes precisely how Ipswich wanted us to. "I need more control from my team. My team is working very hard and fighting. "We need more control because if we play the same way as Ipswich, they are stronger - more physical. My team is a little bit different." Match ends, Ipswich Town 1, Watford 0. Second Half ends, Ipswich Town 1, Watford 0. Attempt missed. Troy Deeney (Watford) header from the centre of the box misses to the right. Assisted by Juan Carlos Paredes. Attempt saved. Gianni Munari (Watford) left footed shot from the left side of the box is saved in the centre of the goal. Assisted by Odion Ighalo. Attempt blocked. Matej Vydra (Watford) right footed shot from the left side of the box is blocked. Stephen Hunt (Ipswich Town) wins a free kick on the right wing. Substitution, Watford. Sean Murray replaces Keith Andrews. Goal! Ipswich Town 1, Watford 0. Tommy Smith (Ipswich Town) right footed shot from the centre of the box to the centre of the goal following a set piece situation. Attempt blocked. Kevin Bru (Ipswich Town) right footed shot from the right side of the box is blocked. Dangerous play by Daniel Pudil (Watford). Corner, Watford. Conceded by Christophe Berra. Attempt blocked. Odion Ighalo (Watford) left footed shot from the centre of the box is blocked. Assisted by Troy Deeney. Attempt saved. Kevin Bru (Ipswich Town) right footed shot from outside the box is saved in the bottom left corner. Assisted by Teddy Bishop. Attempt missed. Kevin Bru (Ipswich Town) right footed shot from outside the box is close, but misses to the left following a corner. Corner, Ipswich Town. Conceded by Sebastien Bassong. Substitution, Watford. Odion Ighalo replaces Fernando Forestieri. Attempt missed. Fernando Forestieri (Watford) right footed shot from very close range is too high. Assisted by Matej Vydra with a cross following a fast break. Attempt missed. Stephen Hunt (Ipswich Town) left footed shot from the left side of the box is just a bit too high. Assisted by David McGoldrick. Substitution, Ipswich Town. Teddy Bishop replaces Jonathan Williams because of an injury.